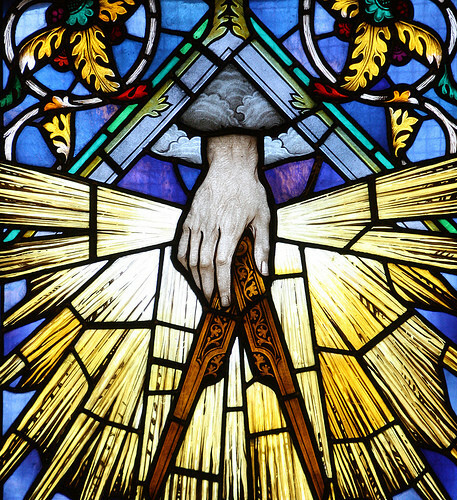 An allegory “represents by suggestive resemblance”; a symbol is “a visible sign or representation of an idea.” Masonry is a course of moral instruction which uses both allegories and symbols to teach its lessons. Today, Freemasonry has been defined by Brother Charles C. Hunt of Iowa as “an organized society of men symbolically applying the principles of operative Masonry and architecture to the science and art of character building.” This means applying Masonic principles will help you build a positive character. The basic purpose of Freemasonry is to make “better men out of good men.” There is an emphasis placed on the individual man by strengthening his character, improving his moral and spiritual outlook, and broadening his mental horizons. applying these lessons in practice in daily life. This is how we try to build a better world. We endeavor to build better men that will work in and improve their own communities. Freemasonry promotes universal peace through the Brotherhood of Man and the Fatherhood of God. Freemasonry also seeks to enlighten the mind, promote peace and understanding in whatever may enhance and adorn man’s contacts with man, and stimulate the noble and generous impulses of the human heart to practice the basic tenets of Brotherly Love, Relief, and Truth.